BRICS is the most prominent emerging market economics i.e. Brazil, Russia, India, China and South Africa. Emerging trend show that in recent years the BRICS group has become a major force in the global economic arenal The OECD has predicted that the balcnce of the economic power is expected to shft dramatically over the next 50 years with China, replacing United States, becoming the most powerful economy of the world. It has also projected that India's GDP growth wil surpass United States. Further it has presence of two largest economies of two continent Africa and South America . The motive for BRICS countries to form a partnership derive from their shared quest for economics and social devoloment and for access to new markets. Intially their was four members in this group and was known as BRIC. The acronym BRIC was first used in 2001 by Goldman Sachs in their Global Economics Paper, "The World Needs Better Economic BRICs" on the basis of econometric analyses projecting that the economies of Brazil, Russia, India and China would individually and collectively occupy far greater economic space and would be amongst the world’s largest economies in the next 50 years or so. the group members were Brazil, Russia, India and China. Later South Africa joins and it become BRICS. 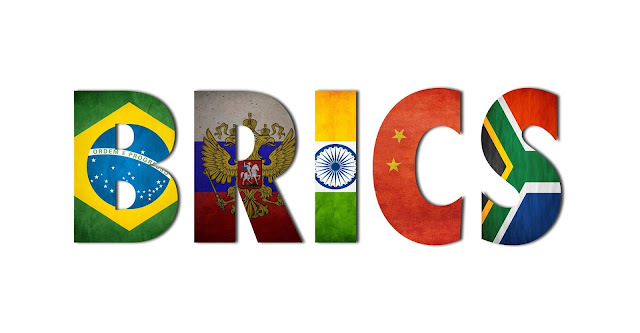 It was agreed to expand BRIC into BRICS with the inclusion of South Africa at the BRIC Foreign Ministers’ meeting in New York in September 2010. Accordingly, South Africa attended the 3rd BRICS Summit in Sanya, China on 14 April 2011. Corporation serves not only the common interest of BRICS members, but also the global economy at large the brick country now account for 19% of world GDP and 61% of overall Global growth. The BRICS members are regional to the point they have little contact with each other. Therefore, they struggle to come up with the substantive agenda .